The Treatment process involves the timber being impregnated with preservative by the VPI (Vacuum Pressure Impregnation) process in specially designed treatment plants. Once the solution has penetrated the Sapwood, the elements are chemically fixed into the timber and are highly resistant to leaching out. Prior to treatment, all timber is seasoned (air or kiln-dried) to remove moisture that would otherwise inhibit the uptake of the preservative chemicals. For water-borne and oil-borne treatments the timber is usually dried to a moisture content between 15-20 per cent. Timber to be LOSP treated is machined to its final size and as far as practicable. 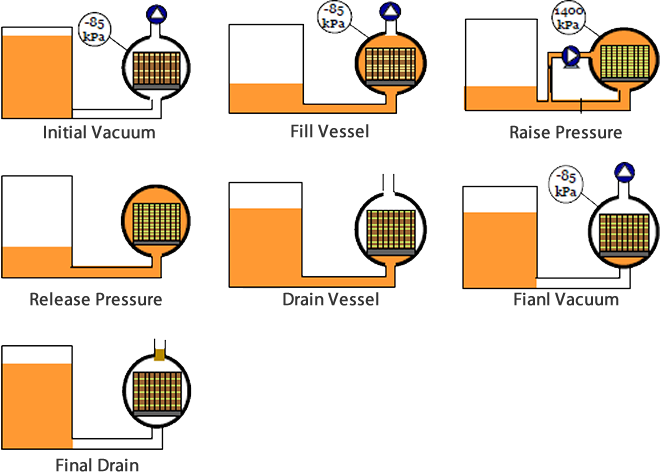 LOSP treatment uses relatively low pressures. Timber distortion is minimised because the treatment is solvent based. This animation explains the pressure treating process typically used to treat timber with preservatives for residential, agricultural and commercial uses. Pressure treating timber products is an effective and proven way to protect it from rot, fungal decay, and termite attack. Treated timber can be used in most outdoor applications where the timber needs to be protected. It is a great choice for timber decks, fences, walkways, retaining walls, fresh water boat docks and other outdoor projects.